Zuckerberg says the inspiration behind Facebook's organ donation push comes from COO Sheryl Sandberg and Dr. Andrew M. Cameron, a transplant surgeon at John Hopkins Hospital in Baltimore. Zuckerberg attended Harvard with Sandberg and together came up with the idea after meeting at a college reunion last spring, according to a John Hopkins press release. Zuckerberg early Tuesday told the ABC new program Good Morning America his girlfriend, Priscilla Chan, who is studying to be a pediatrician, was also an inspiration. Users living in the U.S. and U.K. that want to become donors can use the new feature to sign-up with their respective organ donor registries. Facebook's announcement follows reports from late Monday that the social network was getting ready to release a new life-saving tool. If successful, Facebook's organ donor push has the potential to help save the lives of the more than 114,000 people in the U.S. currently waiting for new kidneys, lungs, hearts, and other organs. In an interview GMA co-host Robin Roberts asked why organ donation? Zuckerberg said that he was impressed by the way communities hit by tragedies such those recently in tornadoes Missouri and in Japan used Facebook to organize and find family. "We figured is there anything we can do to help people solve other types of issues. Like all the people who need organ donations," Zuckerberg told GMA. Every day an average of 18 Americans die while waiting for a life-saving transplant, while another 79 people receive a new transplant during the same time, according to the U.S. Department of Health and Human Services. There are currently more than 100 million people in the U.S. who have agreed to be organ donors. 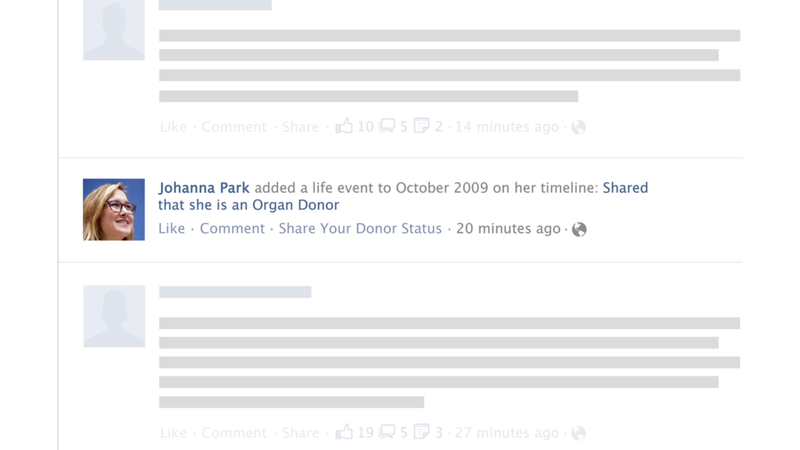 If you want to post your organ donor status to your profile navigate to your Facebook Timeline and select "Life Event" from the status update box. 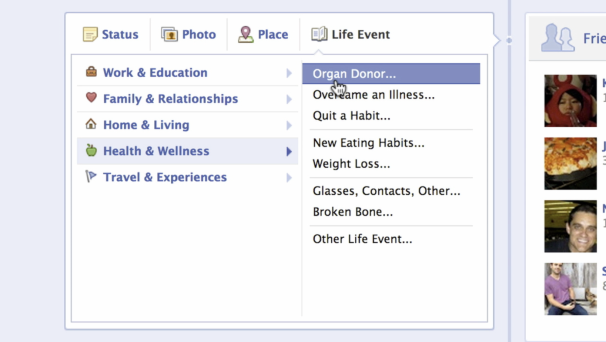 In the drop down menu that appears select Health & Wellness and then "Organ Donor...". You will then see a pop-up window where you can enter your organ donor status, when you became an organ donor, and even share a story about why you chose to become an organ donor. Facebook's goal to help solve the problem of organ donation is laudable, but to be effective users will have to embrace the idea of sharing information that some may see as incredibly personal. But organ donation may also be the ultimate form of so-called slacktivism that many critics say is popular among the social network's users. Slacktivism is when someone participates in an activist cause by doing nothing more than signing a petition or creating a status update drawing attention to a critical issue. The move costs you almost nothing in terms of effort, but can provide a warm, fuzzy feeling for having "stood up" for a cause. Registering as an organ donor fits perfectly into this model since all you have to do is register your name online and then post an update to your Facebook Timeline. Then, in the unlikely event that you die in an accident or other situation that leaves your organs in good condition, your body parts may help save another person's life.